A vehicle lifestyle comparison with Annette McLeod. Joe is a fiscally conscious empty-nester on the downward slope from middle age; Annette is a single mom with a primary school son. Joe: So this is one of those surprising models that maybe not too many people know about. Many are familiar with Honda’s CR-V, which has gotten progressively bigger since it was introduced in 1995. It’s also gotten substantially more expensive over those 20 years, and today sits a bit outside the parameters we set here, which is $25,000 MSRP or a (roughly) $350 monthly payment. The HR-V starts at $22,692 for the LX 2WD model, which is the model we’ll look at, with a 48-month, zero-down lease payment of $347. If you want a shorter lease but want to keep the same payment, you’re going to have to negotiate down payment, buyout, usage, etc. Now for some people 4WD is non-negotiable and for that, you’d have to shell out another $1,600. We’ve had a fairly easy winter in the GTA that might have allowed you to get through with front wheel drive, but previous winters indicate that maybe 4WD is a good investment. Also, if you attend a cottage every weekend and the road sometimes offers up even a chance at impassability, you may deem 4WD essential. Personally, I’m good with the combination of drivability and weight offered by front wheel drive but then I don’t venture too far from paved roads (albeit sometimes snow covered or otherwise slickened). Given the choice to save $1,600, I’ll take it. Nettie: It’s not essential for me either. My daily driver has it so maybe I’ve gotten spoiled, but I drove front-wheel-drive cars for years before this one and I got through OK. I live near a main thoroughfare, which is near a highway, and I’m not a cottage-goer. I prefer not to go out at all between the end of November and the beginning of April if I can help it. At about the same price as a Civic coupe, it’s a completely different option. It lacks in sportiness, compared both to a similarly priced Honda and to several of its segment competitors, but for someone like me, who prizes space and functionality over sportiness, that monthly lease payment is a good deal, and I’d rather spend it on this. Although for longer trips, I thought the seat bottoms were a little too shallow — I would have liked a little more thigh support — it would otherwise serve my little bunch well. I’m five-foot-three and spend a lot of time with my 6-year-old boy, and we both found it effortless to get in and out of. It makes my life a little easier when he can shut his own door and strap himself in, and he likes the feeling of accomplishment. He had no problems here. I would have liked some cupholders for him in the centre of the backseat, but I’m sure we could manage with some after-market contraption. I really liked the easy-open hatch and the generous cargo space, and the flip-down back seats. The load floor is low and flat, which with my limited wing span made grocery-hauling easy, and it would be good for the big dog I hope is in my near future. 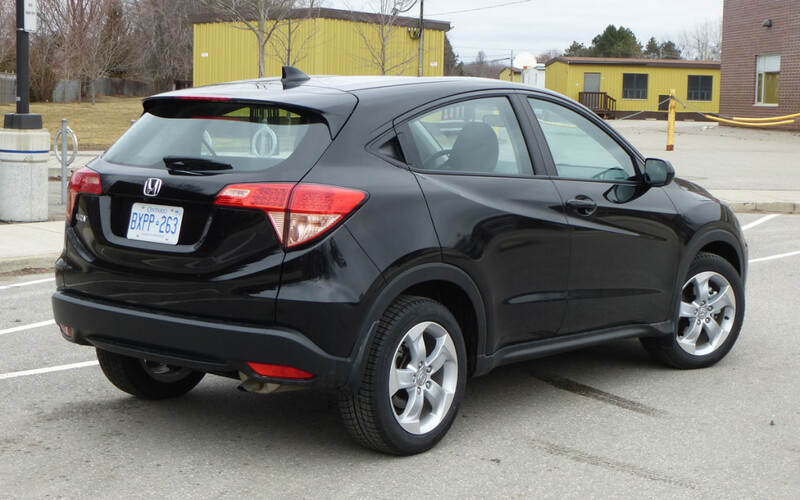 Joe: Yeah, for a relatively tiny vehicle, the HR-V has a fair abundance of interior space and like your son, I found the rear fairly easy to get in and out of, so I know whatever passengers I take along won’t have many problems either. The cargo area is substantial either with the rear seats in use or folded (partially or fully). It would have been nice to have the feature of the tiny Fit’s rear seat, where the bottom folds up so you can carry tall cargo standing up (which would come in handy for transporting that plant you might buy for Mother’s Day). Ergonomically, I found it a mixed bag. Yes, I also noticed the absence of rear cupholders (though the doors had availability for bottles, which is not always a replacement) and I found some of the storage cubbies around the driver insufficient for all the things I need to take along — mobile phone, reading glasses, sunglasses, gloves, etc. I also found the controls, especially around the centre display, a tad difficult to work with. I don’t mind the electronics and I’m generally attracted to digital displays, but sometimes the way they work isn’t intuitive and even after learning what they do, I sometimes find it requiring too many button pushes or screen touches or swipes. At least I didn’t have to put up with leaves growing over my instruments or animated graphics on the touchscreen. Nettie: I am not a fan of the all-digital environment. I like some, like for clocks and navigation, but I couldn’t find a single button or knob in here and I missed them. I thought the instrument cluster right in front of the driver was cleanly designed and clear, but I liked the touchscreen less and outright disliked the climate controls. With no tactile clues of what you’re grabbing, you’ve got no choice but to look down. The icons on the touchscreen are unattractive and look a bit outdated for the high-tech look around it. High tech drawn in a low-tech way. It takes up a lot of visual space in the cockpit, too, so it’s not like you can just ignore it. The digital parking brake completely flummoxed me. It seemed like it should be simple, and once I cottoned to the fact that your foot had to be on the brake to set it, I managed to turn it on and off, but I always had to poke at it a few times to make it do what I wanted it to. And it’s all in a bit too stark contrast with the old-school stick in the midst of it all. Joe: I found it hard to understand at the beginning but once I got used to it, it worked fine. I fear, though, that it could be something that becomes more prevalent in vehicles. Everything’s done by wire now — acceleration, braking, steering — so finding ways to do away with the mechanical levers is also evolving. We already have automatic shifters that are knobs and I wonder how long before we have push-button controls even for manual transmissions such as this. And speaking of which, I’ve always said Honda makes the best manual transmissions and the one in the HR-V is amazing, with nice short and smooth throws, and a clutch that was so easy to work, compared to the seemingly cumbersome one in my daily driver. Even my shifter seems so notchy and clunky compared to the velvety smoothness of this one. I found it made the entire driving experience so much more enjoyable — the ride seems smoother, the handling seems slicker. I don’t know if that had anything to do with it, but I found the entire commuting experience comfortable and on those occasions when I did find a twisty road I was able to carry some speed, I found the vehicle easy to control and predictable. Nettie: I enjoyed the experience too. In fact, it wasn’t long before I didn’t much notice I was driving it, which in a primary vehicle that has to serve multiple uses, is not a bad thing. 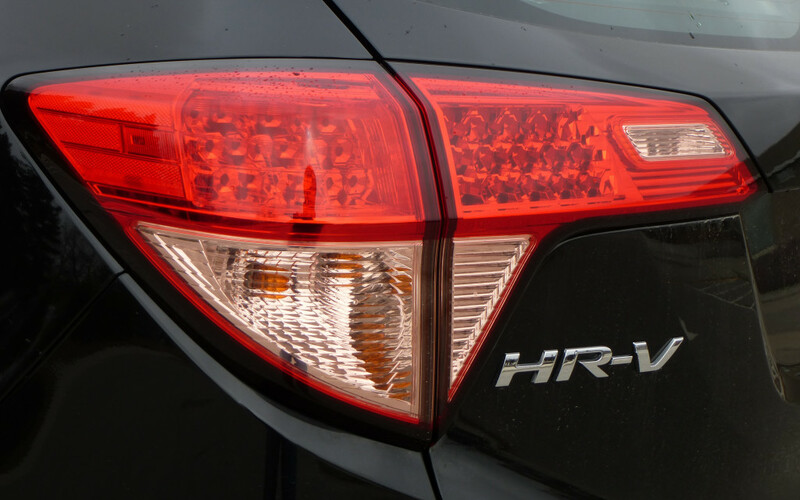 It’s a good combination of practicality and performance, and assuming it will go on to see the good resale values we expect from our Hondas, it deserves to do well. There are a lot of vehicles in this price range, both inside and outside the crossover segment. We are a two-truck family now, so I’ve been mulling over going smaller and cheaper when the lease is up on my Forester in August, I’ll definitely give the HR-V another look.